On 11 June 2016 on the occasion of the feast of Apostle Barnabas, known as the founder of the Church of Cyprus, Greek Orthodox faithful visited and prayed at the main Cathedral of the historic monastery dedicated to Apostle Barnabas during an annual pilgrimage, currently used as an icon and archeological museum by the Turkish Cypriots. As a sign of mutual respect and within the framework of the RTCYPP, the Mufti of Cyprus, H.E Dr Talip Atalay sent his representative to bring greetings of goodwill to the Christian faithful and to H.B. Chrysostomos II, Archbishop of the Church of Cyprus. This follows a gesture of good will by H.B. 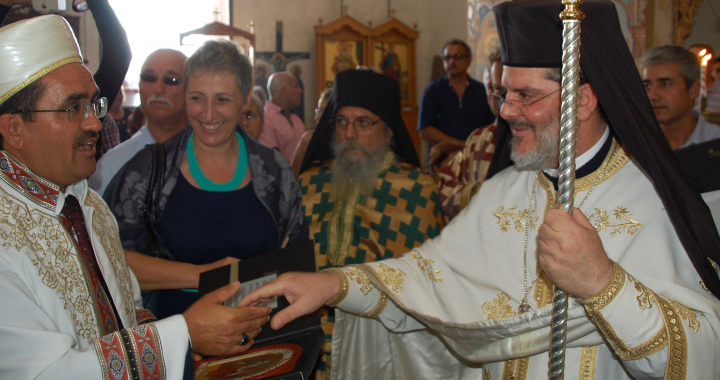 Archbishop Chrysostomos II in 2015 when he sent his representative to greet the Muslim faithful of Turkish origin at a special pilgrimage to Hala Sultan Tekke on the occasion of Eid Ul Adha or Qurban Bayram as it is known in Cyprus. A small delegation of Ambassadors and country representatives from Austria, Finland, Ireland, USA and France joined the Swedish Ambassador and the Office of the Religious Track of the Cyprus Peace Process (RTCYPP) as a sign of their support to the religious leaders’ dialogue for peace in Cyprus and an affirmation of their efforts for the respect of freedom of religion or belief. 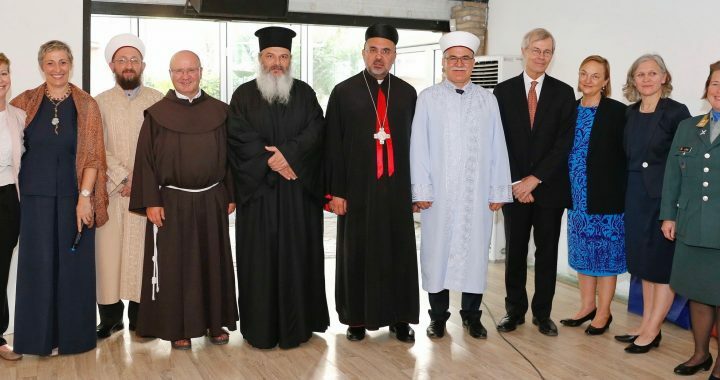 The religious leaders reiterated their conviction that freedom of religion is not only part of the Universal Declaration of Human Rights and the Convention for the Protection of Human Rights and Fundamental Freedoms of the Council of Europe it is also part of the teachings of Christianity and Islam. “We remain hopeful when we see that the religious leaders of Cyprus irrespective of religion and dogma, express their respect for each other’s faith and places of worship, support free access to all religious institutions and accept each other’s differences, culture and religion as a richness.” Says Salpy Eskidjian, Executive Coordinator of the RTCYPP. Apostle Barnabas was born in Cyprus and was stoned to death in Salamis in 45 AD. He is described as ‘a good man, full of the Holy Spirit and of faith’ (Acts 6:24). Barnabas, means ‘son of consolation’ or ‘man of encouragement.’ Although Barnabas was not among the original Twelve Apostles, he is traditionally thought to have been among the 72 commissioned by Jesus to preach; thus, he is given the honorary title of Apostle. He is considered the founder of the Church of Cyprus. The Religious Leaders of Cyprus came together for a thanksgiving reception in honour of special friends of the Religious Track of the Cyprus Peace Process under the Auspices of the Embassy of Sweden (RTCYPP) who are scheduled to leave Cyprus this summer; Special Representative of the UN Secretary-General and Chief of Mission Lisa M. Buttenheim, H.E. the Ambassador of Finland Anu Saarela, UNFICYP Force Commander Major General Kristin Lund, and H.E. the Ambassador of Sweden Klas Gierow. “We are here to celebrate, to acknowledge, to recognize, to give thanks, to pledge. Despite setbacks or disappointments, we have hope. Dialogue and cooperation in Cyprus will persevere as the religious leaders know too well that a united witness for peace, a united voice for human rights is better than the success or failure of one alone” Said Salpy Eskidjian, the Executive Coordinator of the Office of RTCYPP, who hosted the event on May 31, 2016 in the Buffer Zone in Nicosia. Mufti of Cyprus, H.E. Dr. Atalay in thanking the honoured guests for all their support and good work for peace in Cyprus expressed his sadness for their departure. He reiterated that as religious leaders’ “From the beginning we have been very supportive of free access to places of worship. In principle this is part of our religion, religious monuments should always be respected. We all support religious freedom. Our job is not to do politics but to create and build hope in the hearts of people so that our hearts, tongues and actions would be identical”. All the religious leaders warmly thanked the Swedish government and the four guests of honour for their tireless efforts for Cyprus and their support to the Religious Track. In the closing message, H.E Archbishop Y. Souief of the Maronite Church expressed his commitment that the religious leaders of Cyprus will continue to work together “to build a culture of justice, a culture of peace, a culture of reconciliation, a culture of love not only in Cyprus but also in the region and become a beacon of hope everywhere”. The guests of honour gave heartening messages of support and encouragement, reiterating that the efforts of the religious track give them hope as they leave the island. They all expressed their wish that the religious leaders continue their peacebuilding efforts and strive together for a reunited Cyprus where all Cypriots can live together in peace and the rights of all are respected.